The cover portrays Adam, the first man, in the Garden of Eden. His head is tilted up toward the serpent Satan, who is nestled in the Tree of the Knowledge of Good and Evil whispering to Adam. Before this encounter with the serpent, man was perfect and was able to speak and communicate without flaw. However, this interaction taught him a new language. As represented by the cover image, the serpent teaches man the language of temptation, greed, and evil, which man had not previously known. 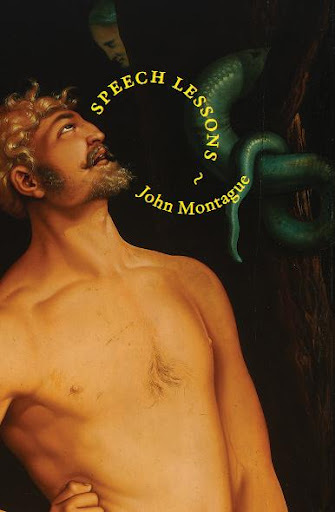 As the book’s title suggests, Montague focuses largely on the restrictions, frustrations, and disappointments that derive from man’s inability to efficiently communicate. The title of the collection, Speech Lessons, is printed in a semi-circle that sits in front of Adam’s face. The poet’s name, also curved in a semi-circle, hangs lower near Adam’s chin. If properly aligned, these two components would form a full circle. However, their separation can represent the broken speech that Montague, who has a stutter himself, focuses on in so much of the book. In the poem titled “Speech Lesson,” for example, the narrator asks “When will I learn again to speak?” The poem explores the limitations and frustrations of trying to communicate through a tainted, broken language. Montague references the fall of man within the book in the poem “Adam’s Apple.” In the poem, Montague describes Adam’s consumption of the fruit from the Tree of Knowledge. The fruit becomes permanently lodged in man’s throat, eternally handicapping his ability to speak. Be sure to get a copy of Speech Lessons, which will be released in mid-April of this year!